After reviewing the new devices we saw yesterday—the Blackberry Bold 9650 and the Pearl 3G—RIM CEO Mike Lazaridis revealed what we've been waiting for at this year's WES: BlackBerry 6.0. Updated: Video! It's been a while since we've seen anything new for BlackBerry users in terms of interface (we were beginning to feel like Nokia users! )—but finally RIM has confirmed BlackBerry OS 6.0 will be out later this year. During an analyst call yesterday, RIM CEO Mike Lazaridis confirmed the new OS was on its way, arriving sometime in the third quarter—between July and September, basically. Leaked screengrabs have already shown it'll have a new homescreen with customizable icons, a brand new browser with tab support, and a redesigned media player. • Homescreen: A new design with smaller wallpaper real estate, the customizable icons will be arranged any which way you want. Pages will work similar to how the various screens of Android already do, with media-centric icons grouped together and so on. • Browser: It'll support multitouch (kiss goodbye to the little magnifying glass), new favorites, and tabs. Judging by the leaked screengrabs we've seen, changing tabs will be similar to on an iPhone or Android—with the ability to open new tabs by pressing on a + sign. • Media player: supports multitouch, with a finger swipe needed for browsing album covers, and again, it's very iPhone-like. Better start ensuring you've Google imaged and added all the album artwork to make the search functionality work well. • Multitouch: It'll be included natively in all sorts of programs, including emails. • Messaging: It'll stay roughly the same, which is a good call for RIM, considering they're famed for having the best messaging system available for phones. There'll be a few small additions, such as larger thumbnails to determine the type of message, and integrated RSS feeds—which could be a bit too much work and hassle. 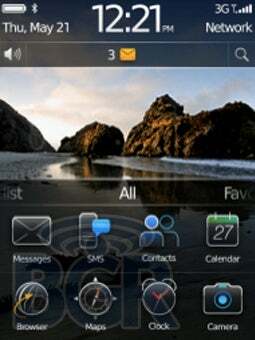 • Commands: Instead of constantly pressing menu, touchscreen models will support pop-up commands. Sending an email, you could click and hold the email and choose send from the pop-up box, as opposed to hitting menu and send from there. It's not revolutionary, but may be better designed and intuitive. • Media: Photos will appear all at once, instead of loading one by one—which irritates the heck out of me.